The Automatic Mistie wizard performs a series of calculations to determine the best corrections to apply. The calculation varies depending on which parameters are chosen to tie: time, phase and amplitude. Calculate the cross-correlation between the traces. Calculate the envelope and instantaneous phase for the cross-correlation function. Find the peak of the correlation envelope. This is the optimum time-shift to correct any mis-tie, independent of phase. The optimal phase rotation is the instantaneous phase at this location. The shift and rotation is applied, then the optimal scalar multiplier is calculated to minimize the RMS difference between the traces. For each intersection, Insight selects traces for comparison around the intersection. For a 2D/3D intersection, this is the specified number of traces. For a 3D/3D intersection, Insight selects all of the traces where the 2D line overlaps the 3D data. For a 3D/3D intersection, Insight chooses a random sampling of traces within the region that overlaps (or specified polygon). Insight calculates the optimal time-shift and amplitude scaling for each intersection independently (see above). In most cases — where many lines intersect each other in a complex grid — these optimal shifts and amplitude scalings cannot be applied. For example, if three lines intersect to form a triangle, and the amount of shift/scaling required is different at the two ends of the line, it cannot apply a single uniform correction. So Insight computes a single shift/scaling for each line that will minimise the total residual mismatch for all the lines at the end. Once the final time-shifts have been calculated, the optimal phase-shifts for each intersection can be calculated independently. As above, a single phase shift is calculated for each line or 3D volume that will minimise the total residual mistie. 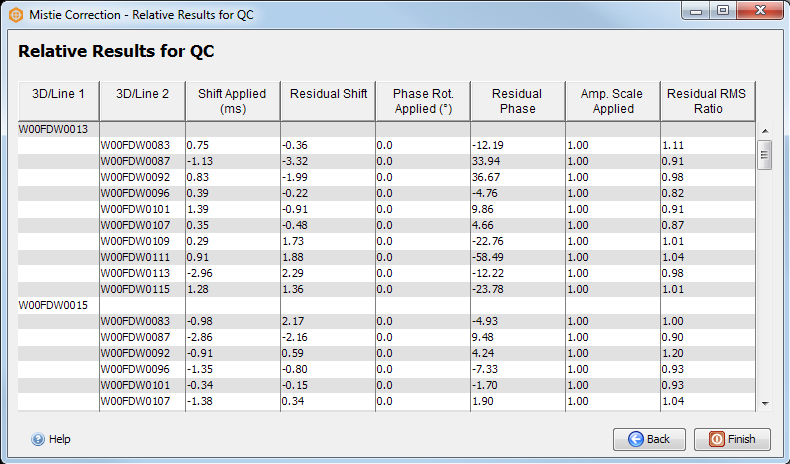 The Relative Results for QC table shows the relative corrections at each intersection. 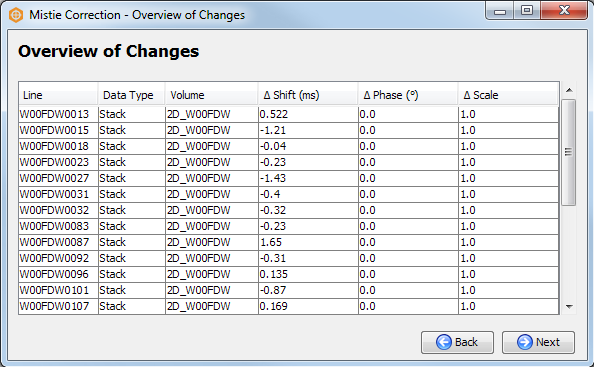 The Overview of Changes table shows the final absolute corrections that will be applied to every line or volume.